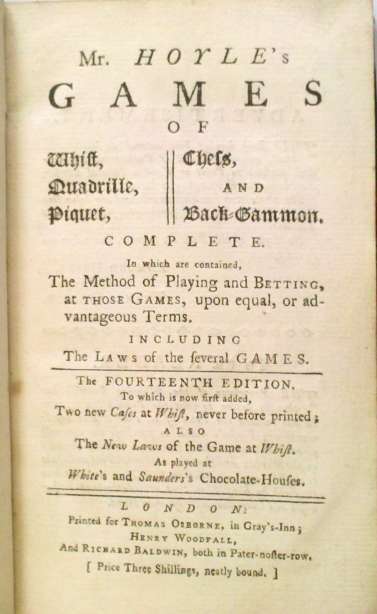 I have two copies of the "fourteenth" edition of Mr. Hoyle's Games, one with a cancelled title page. What story does this cancellation tell? 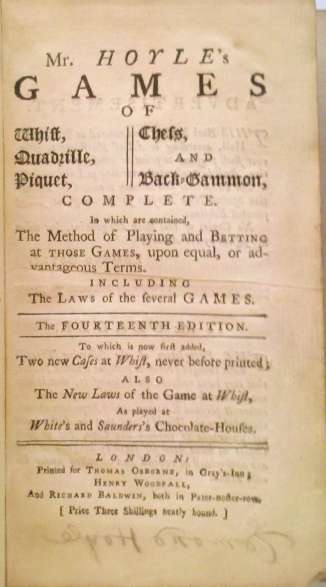 The original title page is above to the left and the replacement to the right. The text is the same (though the replacement has an extra rule below the statement of edition), but they are clearly different settings of type. Both title pages bear the imprint is "Printed for Thomas Osborne, in Gray's-Inn; Henry Woodfall, and Richard Baldwin, both in Pater-noster-row." 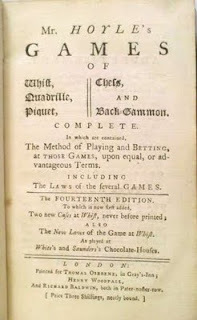 The book is undated, but it was first advertised in the St. James's Chronicle or the British Evening Post of December 12, 1767. The advertisement on the left says that no copies are genuine, unless signed by Edmond Hoyle and publisher Thomas Osborne, though in fact the book is not autographed. 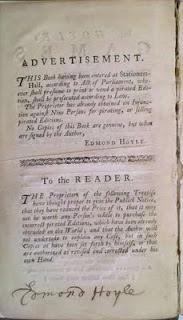 The advertisement on the right calls for the signature of the author only, and in fact Hoyle's autograph is present. There is a further clue in the newspaper advertisement. It contains a statement of responsibility different from the title page, beginning "Printed by assignment from T. Osborne..." (emphasis added) for Woodfall, Baldwin, Crowder and Wilkie, more booksellers than are listed on the imprint. Can we explain the differences? In an earlier post, I discussed the Thomas Osborne trade sale of July 1767. 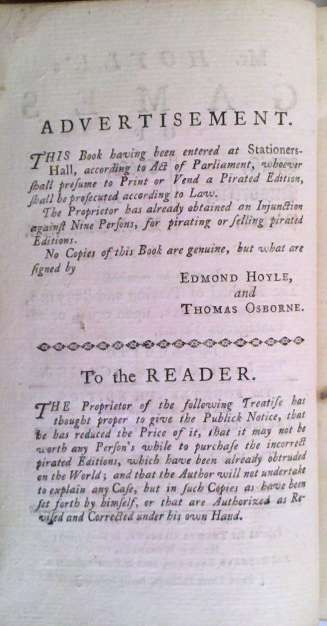 At that time Osborne left the trade, selling all of his books and copyrights, including his share of the rights to Hoyle. A month after the sale, Osborne died, suggesting that gave up publishing because of illness. This, then, was the first edition of Hoyle published after Osborne's death. 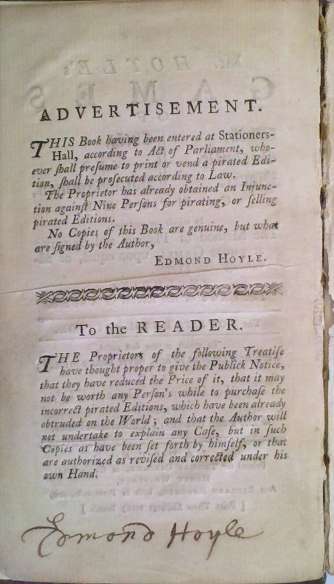 Wilkie, one of the new booksellers listed in the newspaper advertisement, purchased a share of the Hoyle copyright at the sale. Osborne (and Hoyle) had signed the "tenth" through "thirteenth" editions of the work, and as printed, the title page of the "fourteenth" called for his signature. Was Obsorne's death enough of a reason to justify the expense of cancelling the title page? Perhaps, but it seems odd that only the verso was changed. Why not change the imprint on the title page itself to reflect accurately the booksellers who were selling the book? I only can speculate that the booksellers were wrestling with the mechanics of getting Hoyle to sign the books. Hoyle and Osborne had a relationship of more than twenty years dating back to Osborne's purchase of the Hoyle copyright in 1745. Hoyle was under contract to sign the books for Osborne (see my "Pirates, Autographs, and a Bankruptcy" p144) and Hoyle signed the unbound books. Perhaps the new publishers had no relationship with Hoyle and didn't know how best to obtain his signature. Perhaps they found it easier, or more comfortable, to send Hoyle a stack of the substitute title pages, rather than the entire book. Perhaps the new publishers had the book bound before obtaining the signature. Yes, all speculation, and we'll never know for certain. It is clear that the cancel somehow relates to the death of Osborne, and it seems strange that the imprint was not corrected. Note: Most copies have the cancelled title page, though there are some, like one of mine, with the original title. Interestingly, there are two copies of this book that have both title pages, one at the British Library (shelf mark 7921.dd.2) and one at the Bodleian (shelf mark Jessel f.565). A bibliographer would consider the "ideal copy" to be the one with the autographed title page only--that was clearly the version that was intended to be published. Have I mentioned the bibliographer's mantra--examine as many copies as possible? 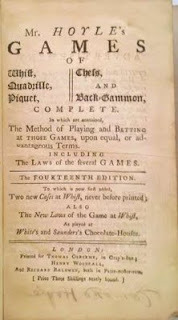 David Levy, "Pirates, Autographs, and a Bankruptcy: A Short Treatise on the Game of Whist by Edmond Hoyle, Gentleman," Script & Print, 34 no. 3 (2010): 133-61. When did Hoyle come off copyright?